The High Sheriff of Northumberland is taking off her hat and putting on her waders to help local youth groups. The Youth Against Crime Awards Scheme is supported by the High Sheriff’s Fund who this year seeks to fundraise with a difference by highlighting one of the nations most popular but sometimes least publicised sports of fly fishing. Many youth groups and organisations across Northumberland are supported by the scheme annually and rely on this financial support to keep open and to keep up their outstanding work. With many group leaders working for little or no wage, the scheme supports the everyday running or items such as equipment, catering and often simple things such as heating and lighting costs. This year the fundraising is through a national Raffle and Auction of Tyne fishing beats. These beats have been generously donated by riparian owners (who include the Duke of Northumberland and Lord Allendale) on fishing that would be often inaccessible to the public. 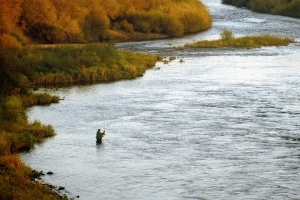 Both events are being run online and will close simultaneously on the 19th October 2012 with all fishing to be arranged for the 2013 season. With ten beats on offer in the Raffle and over ten in the Auction this is one of the largest events of Tyne fishing. FishPal is hosting the Auction and link to the Raffle Each £10 raffle ticket enables the entrant to enter for each of 10 raffle lots of excellent sea trout and salmon fishing beats making it an outstanding offer. Harriet Benson, High Sheriff of Northumberland says. “These groups are sometimes the only after school activities these children take part it; it is often the only place to go. The leaders of these organisations are doing everything they can to encourage and support young people in the local community. I hope anglers donate generously to support this worthy cause”. The Youth Against Crime Awards Scheme makes annual awards to groups in the community who encourage beneficial pursuits for young people in Northumberland and supporting them to become better citizens as a deterrent against criminal activities. With a simple application process groups can gain access to fund quickly which might otherwise lead to their closure.